The weather has only started to turn for the better this week which meant I can finally wear my dresses. I'm not complaining. Not one whit. But I can't stop thinking about jackets. While most of my friends are planning their wardrobe for the summer holiday in France, I'm looking at the Fall collection. I swear half of the population of this country converge in either South of France or Brittany in August. Ahem. We're no different. I've got this motto - if you can't beat them, join 'em. So.... We're renting an apartment in Paris this year. I see eyebrows raised. Eh? Why not a beach? Well, I'm rather odd. I detest swimming in the sea. Ever since my brother and I were surrounded by a school of jellyfish, I've yet to step into the sea. I'm too hyper to sunbathe. I compare sunbathing to being roasted alive in an oven. Morbid, I know. I guess I just have to put up with vampire-like pale skin. At least Edward Cullen is really cool these days so perhaps I can ride on his fame. Right. Sorry. Back to the topic of jackets. I'm fascinated with the more contemporary jackets similar to the boho chic made famous by Isabel Marant. I wouldn't mind a cupboard full of Chanel tweed jackets but at £3-4K a pop, that's never going to happen unless I strike it rich on the lottery. In the meantime, these lovely options will suffice for now. They aren't cheap but at least they're a fraction of a Chanel. 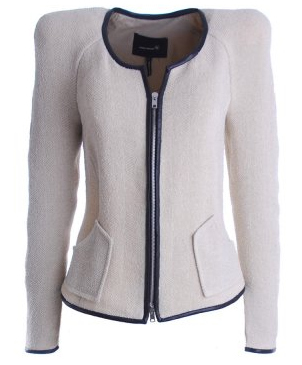 A few months back I was ogling the beautiful Etien jacket by Isabel Marant. It's a reminiscent of a simple Chanel boucle with padded shoulders which I love. I hesitated when I saw the £482 price tag. I don't tend to spend a lot on clothes. Who knew that these would fly out the doors as fast as they came in. Well, imagine my delight when I saw one at Morgan Clare for £289 in my size! I'm always a little apprehensive when buying clothes online. It's even harder with a jacket because they have to fit just right. I am over the moon at the moment because a size 1 fits beautifully without being too snug. There's room to layer on cooler days. I don't need to have the sleeves taken in. By the way, there's another left in size 1 if any of you are interested. Here's a photo of Heidi Klum rocking hers. I wouldn't have paired it with the striped pants (also by Isabel Marant) but that's just me. I think little jackets make the wardrobe and that one is perfection! I think so too. It's pretty lightweight which is perfect for spring/summer. I really love this jacket! It looks like it can elevate the most basic look and make it very chic. Hi LV, thank you for stopping by. You've put it better than I could.